Since my tofu slimed out on me, I had to figure out what to do with the cabbage and broccoli I had planned to use for that. The broccoli made a most successful transition to the Chile Chicken Pilaf, so I had to figure something out for the cabbage. Now, I try to eat legumes for at least one meal a day. So far, it's been easy to do because I've been finding so many new ways to cook them that I never get tired of any one bean or recipe. So it kind of surprised me the other day when I realized that I didn't have any beans soaking, thawing, or otherwise waiting to be prepped and consumed. In this case, lentils seemed the thing to do because they don't require any soaking time and they cook relatively quickly. Great. I had the lentils. What to do with them? I knew I had the cabbage to use up, so I thought it made sense to put them together. I figured I could make a great soup using the cabbage and the lentils. And I had the perfect base recipe. 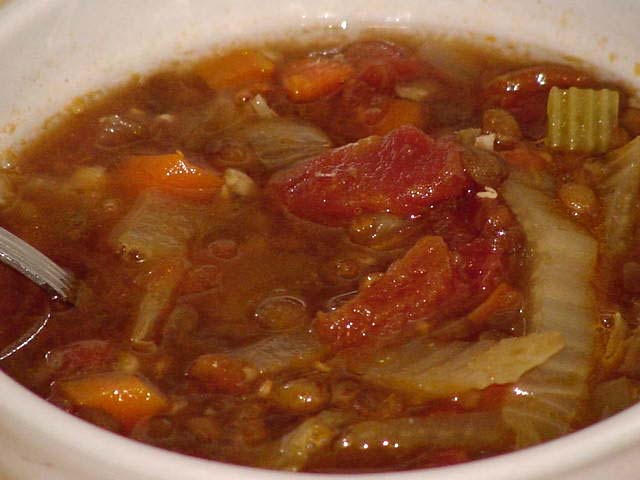 The Faki (Greek Lentil Soup) I posted about back in November would be perfect with cabbage added in, and I had all of the ingredients already on hand. I didn't feel like making a 4-quart soup, though, so I simply halved the recipe. It came out great. Because most pre-packaged vegetable stock is stronger than I like and can overpower anything I put it in, I usually dilute it with water or some other liquid. I didn't want to open a whole can of tomato sauce, so I decided to use diced tomatoes instead of the sauce, and use the juice from the tomatoes to dilute the vegetable broth. The outcome was a delicious soup that is hearty enough for winter, but still has enough lightness that it can work in the warmer months as well. Drain tomatoes and set aside. Add water to the juice make 1 quart. Place lentils in large soup pot with the juice/water mix and the vegetable broth and bring to a boil. Reduce heat and simmer 1 hour, or until tender. Add onions, carrots, celery, cabbage, garlic, tomatoes, olive oil, oregano and salt and pepper to taste. Cook for 30 mins longer, or until soup is slightly thickened. Just before serving, stir in the lemon juice or vinegar. I already had everything on hand. I count the celery cabbage as on hand even though I bought it this week because I had already used it for the okonomiyaki, which is why I bought it.